I mean, these sorts of things pall after a bit. I can’t speak of Kanigher in particular, I’ve only read a handful of things by him. I’ve encountered this attitude a number of times in other people during my life, though, and my impression is that this type of person does not believe they could produce higher-quality work even if they did invest the time. The lack of time investment and cavalier attitude are there mostly to cover up their actual lack of talent, or at least lack of confidence in that talent. Kanigher stories were written to be read by themselves, separated by time. Reading them in large collections really does reinforce the patterns and repetition. Which is why I always felt DC should do war reprints as anthologies so that you get a variety of formulas in one collection instead of one formula story after the other. I enjoy my DC War Showcase volumes much, much more if I read them with time in between each story – as they were published and intended to be read. You have turned me on to Nancy and Sluggo — especially the newest incarnation by Olivia Jaimes — so thank you for that. I like floppies because I can open them all the way, unlike trades where I have to break the spine to see a double page spread. Also, it’s fun to read floppies because they retain the thrill of the cliffhanger. AND you get a little chunk of story on a regular basis. With trades, there’s no real suspense and once you’re done you have to wait for ages before the next installment. Digital doesn’t do it for me — I look at computer screens enough in my daily life. 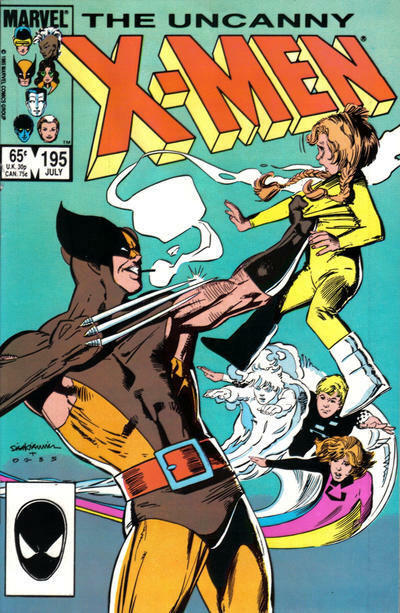 Finally, aside from the questionable content of that X-Men cover, why is Dan Green inking Bill Sienkiewicz? What a weird pairing. The two versions of Sgt.Rock #400 cover prompt me to ask you this question, have you ever had a customer who preferred newsstand covers versus direct market? Someone who thought that what was in the UPC box made a substantial difference to the comic? I know one retailer who thinks newsstand covers triple the price on back issues and wondered how you stood on that difference. On the original subject matter, I have trouble even reading online comics. It just feels dirty. 1) my local LCS where I’d spent every Wednesday with a community of fans folded. I still wanted to read stories every week but was sad to emotionally disconnected from trying to find a new shop. 3) had to choose between space in the house to store my boxes or an art studio. Art studio won. I’m not much of a Bob Kanigher fan, although I admit to having read 100s of his stories (I’ve read most of the DC war comics), so obviously I think they are quite readable. I do have friends who were friends of his, and one who knew him as his instructor at the Kubert school. Kanigher never felt he was underpaid at comics, and he was always extremely proud of his work. He was also happy to tell other writers how to improve – well he had been an editor at DC for 25 years, I guess it gets in the blood.